Watch what happens when you bend and break the world’s thinnest glass. This glass, discovered by Cornell researchers and their international team of collaborators, was recently featured in the Guinness Book of World Records and is made of the same compounds as everyday windowpanes. Now, a research team led by David A. Muller, professor of applied and engineering physics and co-director of the Kavli Institute at Cornell for Nanoscale Science, and Ute Kaiser, professor at the University of Ulm, has used an electron microscope to bend, deform and melt the one-molecule-thick glass. 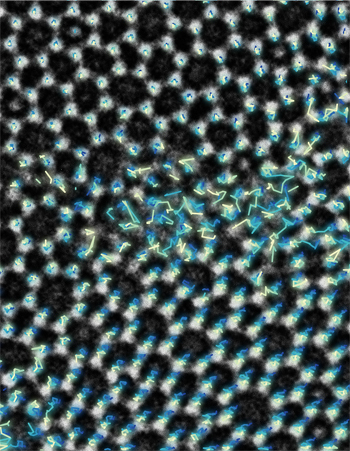 These are all things that happen just before glass shatters, and for the first time, the researchers have directly imaged such deformations and the resulting “dance” of rearranging atoms in silica glass. This newest work is published Oct. 11 in the journal Science. Even though glass is a common material, it is notoriously hard to study, said Pinshane Huang, a graduate student working with Muller and the paper’s first author. Glass is known as an amorphous solid because its atoms are rigid like a crystal but disordered like a liquid. “This thinnest-ever glass gives us a new way of looking at glass and how it breaks, atom by atom,” Huang said. Said Muller: “No one has ever before been able to see how the atoms in a glass rearrange when you push on them.” Sophisticated theories describe how these atoms behave when bent or broken, but the theories have been difficult to verify, said Jim Sethna, professor of physics and paper co-author. “Lots of people have made computer simulations, but this is the experimental realization of what the glass community has been looking for for a long, long time,” Sethna said. “You could say, we have identified some of the basic dance moves,” Muller added. The researchers found something else unexpected: Parts of the glass melted under the electron beam, forming moving boundaries between solid and molten glass. “We don’t understand deeply why glasses are solid. An experiment that lets us watch it freeze could be revealing,” said Sethna. These insights may eventually lead to atom-by-atom designs for stronger glass panes or more robust transistors. The work was supported by the National Science Foundation, the Cornell Center for Materials Research and the Air Force Office of Scientific Research.